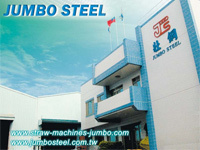 Jumbo Steel Machinery Co., Ltd. is the major manufacturer specializing in PP straw making machine, straw bending machine, straw packing machine, tetra-pack straw packing machine, PP & PET strapping band making machine, PVC heat shrinkable film making machine and extrusion machine. For a close look at machine image and specification. We will be strict to our quality of product standard in order to make customer have good right. Besides, we also provide excellent service to our customer. We guarantee we must make you satisfy with our product and service. Therefore, if you have any question about our product, you can tell us. We will give you early reply. Furthermore, we look forward to searching a good business partner. If you are interested, please feel free to contact with us or you can email to us. Manufacturer of straws bending & packing machines, such as slitting machines, PP & PET strapping band machines, suction hose making machine, PVC heat shrink film machine & production equipment, plastic extrusion machine, stretch film, PLA straw machine, paper drinking straws pakaging machinery, welding equipment.